Carlton's fourth studio album Rabbits on the Run was released on July 26, 2011 under Razor & Tie, the third record label she signed with. Before recording the album, Carlton was unsure whether she wanted to make another record or pursue film scoring instead. After deciding to try again, she decided that she needed to record in the ideal environment, choosing to record at Real World Studios Box, England. [not in citation given] She chose the title for the symbolism often depicted by rabbits – 'time slipping, mind floating' – which is something she has been relating to for the past few years. The album was further inspired by Stephen Hawking's A Brief History of Time and Richard Adams's Watership Down. The dreamy, fantastical sound of the album was achieved by recording direct to tape and features production by Steve Osborne. First single, "Carousel" was released on May 3. On September 19, a tweet in Carlton's account made by her management stated that "I Don't Want to Be a Bride" would be the next single off the record. Via Twitter, Carlton announced that her label wouldn’t produce a video for "I Don't Want to Be a Bride," instead producing one for "Hear the Bells". The music video, which Carlton describes as her most revealing to date, was released on June 7, 2012. In March 2018, Carlton began to release one cover song a month while she continues work on her sixth album. The first of six songs, a cover of "Call Your Girlfriend" by Robyn, was released digitally March 23, 2018. The second, a cover of Fleetwood Mac's "Dreams" was released April 20, 2018. The third, a cover of Neil Young's "Only Love Can Break Your Heart" was released May 18, 2018. The fourth cover, Fred Neil's "Little Bit Of Rain" was released on June 15, 2018. The fifth cover, "Needle in the Hay" by Elliott Smith was released on July 20, 2018. The sixth and final cover song, 'Lonely Girls' by Lucinda Williams was released on August 10, 2018. She has confirmed, that the cover EP will be released as a triple vinyl collection along with Liberman Live and Earlier Things Live EP which will be released November 23, 2018. On October 9, 2013, at a live performance in Bay Shore, New York, Carlton announced that she was expecting her first child with her fiance John McCauley (of the band Deer Tick) and was very early on in her pregnancy. In November, she announced she had experienced an ectopic pregnancy, in which she later suffered a ruptured tube and internal bleeding. After surgery, her entire right fallopian tube was removed. On December 27, 2013, Carlton and McCauley married in a ceremony officiated by Stevie Nicks. ^ a b "Vanessa Carlton: Young Heart EP". NoiseTrade. Retrieved May 7, 2015. ^ a b Carlton, Vanessa (February 28, 2014). "Twitter / Vanessa Carlton: Started in England, finished in Nashville..." Twitter. Retrieved March 3, 2014. ^ a b Moraski, Lauren (June 11, 2014). "Vanessa Carlton on her dreamy new album - CBS News". CBS News. Retrieved June 12, 2014. ^ "Key Whiz". people.com. July 15, 2002. Retrieved December 29, 2013. ^ Lamb, Christopher (April 29, 2002). "Vanessa Carlton: A Thousand Miles To Here". TeenMusic.com. Retrieved February 14, 2013. ^ "Singer-Songwriter Vanessa Carlton Indeed Loves Ruby's in the Afternoon". grubstreet.com. November 30, 2007. Retrieved December 29, 2013. ^ "Vanessa Carlton Bio". YFly.com. Archived from the original on March 19, 2008. Retrieved August 19, 2006. ^ "Vanessa Carlton". IMDb.com. Retrieved February 14, 2013. ^ "handwritten Vanessa Carlton Bio". blackvulture.com. Retrieved April 17, 2008. ^ "Billboard interview". Billboard Magazine. Archived from the original on December 7, 2008. Retrieved April 17, 2008. ^ "Sarah Parkin Bio". musicianguide.com. Retrieved April 16, 2008. ^ "The Making of A Thousand Miles". mtv.com. Retrieved April 17, 2008. ^ "Vanessa Carlton". Variety. July 9, 2003. ^ "Artist Bio". Rock on the net.com. Retrieved April 20, 2008. ^ "Top 40 chart overview". Top40 Charts. Retrieved August 19, 2006. ^ Hasty, Katie. "Billboard Bits: Pearl Jam, Vanessa Carlton, Don Caballero". Billboard. February 24, 2006. Retrieved August 2, 2006. ^ D'Angelo, Joe and Pak, SuChin. "Vanessa Carlton Recalls Her Days As A Naughty Ballerina". MTV News. October 25, 2004. Retrieved February 11, 2007. ^ Sculley, Alan. "Vanessa Carlton strips back studio gloss" Archived September 28, 2007, at the Wayback Machine. The Morning Call. October 20, 2004. Retrieved September 21, 2006. ^ Corneau, Allison. "Carlton maintains musical integrity despite label pressures of conformity". Quinnipiac Chronicle. April 6, 2005. Retrieved September 16, 2006. ^ Miserandino, Dominick A. "Vanessa Carlton – Singer/Songwriter" Archived October 14, 2007, at the Wayback Machine. TheCelebrityCafe.com. Retrieved September 21, 2006. ^ "Vanessa Carlton – White Houses" Archived September 29, 2007, at the Wayback Machine. MusicSquare. Retrieved September 16, 2006. ^ Dionne, Bethany. "Not just an 'ordinary night' with Vanessa Carlton". Quinnipiac Chronicle. April 6, 2005. Retrieved June 10, 2006. ^ Cinquemani, Sal. "Vanessa Carlton: A Pop Princess in Her Living Room". Slant. June 14, 2005. Retrieved September 16, 2006. ^ a b Sclafani, Tony. "Don't Call It a Comeback: Vanessa Carlton" Archived November 22, 2007, at the Wayback Machine. Express. November 20, 2007. ^ "The Projects That Time Forgot" Archived October 1, 2007, at the Wayback Machine. MTV News. January 31, 2005. ^ Fuoco-Karasinski, Christina. "Live Review: Vanessa Carlton in Scottsdale, AZ" Archived November 7, 2007, at the Wayback Machine. liveDaily. November 5, 2007. ^ Carlton, Vanessa. "next chapter" Archived January 23, 2009, at the Wayback Machine. vanessacarlton.com (official Vanessa Carlton website) via NESSAholics.com. August 2, 2005. ^ Vaziri, Aidin. "POP QUIZ: Vanessa Carlton". San Francisco Chronicle. November 4, 2007. ^ "Heroes & Thieves by Vanessa Carlton". Metacritic. ^ Harris, Chris. "Kid Rock's Jesus Overpowers Bruce Springsteen's Magic On Billboard Chart". MTV News. October 17, 2007. ^ Frayed Irv. Entertainment Weekly. December 14, 2007. Retrieved May 10, 2009. ^ Universal Motown. "Vanessa Carlton Announces 'Haunted Club Tour' in Support of Highly Anticipated New Album, Heroes & Thieves" Archived August 25, 2007, at the Wayback Machine. Business Wire. October 8, 2007. ^ Finn, Natalie (July 22, 2008). "Sting, Matthews, Mayer Gamer for Tibet Than Beijing". E-Online. Retrieved May 13, 2010. ^ "Vanessa Carlton Tips Her Hat to Animal Birth Control" (Press release). PETA. 2010. Retrieved May 13, 2010. ^ "vanessa carlton signs razor tie | Razor & Tie". Razorandtie.com. Archived from the original on March 23, 2012. Retrieved March 28, 2012. ^ a b Amar Toor. 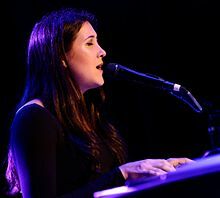 "Vanessa Carlton, 'Rabbits on the Run' – 2011 New Album Preview". Aol radiodate=2011-03-10. Retrieved February 4, 2013. ^ "Vanessa Carlton: Songs, Albums, Pictures, Bios". Amazon.com. August 16, 1980. Retrieved March 28, 2012. ^ "Niet compatibele browser". Facebook. Retrieved July 26, 2010. ^ "Carousel: Vanessa Carlton: MP3 Downloads". Amazon.com. Retrieved May 9, 2011. ^ "Vanessa Carlton Twitter". Twitter.com. Retrieved February 10, 2012. ^ "Vanessa Carlton to release new EP, Hear the Bells, on November 21st". muenmagazine.com. Archived from the original on November 12, 2011. Retrieved November 11, 2011. ^ "Hear The Bells EP: Vanessa Carlton: MP3 Downloads". Amazon.com. Retrieved November 11, 2011. ^ "Twitter / VanessaCarlton: @Fool_4_Music hey! euphoria". Twitter.com. Retrieved March 8, 2013. ^ "Vanessa Carlton - New York News". myfoxny.com. June 9, 2014. Archived from the original on June 12, 2014. Retrieved June 9, 2014. ^ Schrodt, Paul (April 20, 2015). "Exclusive: Listen to the First New Music from Vanessa Carlton in 2015". Esquire. Retrieved April 20, 2015. ^ Andrews, Travis M. (August 3, 2015). "Music Premiere Monday: "Blue Pool" by Vanessa Carlton". Southern Living. Southern Progress Corporation. Archived from the original on August 5, 2015. Retrieved August 3, 2015. ^ Mansfield, Brian (August 27, 2015). "Vanessa Carlton debuts new track 'Willows'". USA Today. Gannett Company. Retrieved August 27, 2015. ^ "Vanessa Carlton's live album coming Oct. 21, watch 'Operator'". The Tennessean. October 4, 2016. Retrieved October 12, 2016. 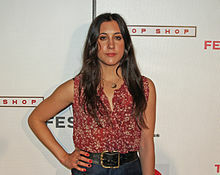 ^ "Vanessa Carlton Says "Love Is An Art" May Be Title Of Her Next Album - Hidden Jams". hiddenjams.com. June 28, 2017. Retrieved March 27, 2018. ^ Zaleski, Annie (October 25, 2004). "Vanessa Carlton Comes Clean". Clevelandscene.com. Retrieved September 30, 2015. ^ Bendix, Trish (June 19, 2010). "Vanessa Carlton comes out as bisexual". AfterEllen.com. Retrieved March 28, 2015. ^ Staff (June 20, 2010). "Vanessa Carlton: I'm Bisexual And Proud". Huffington Post. Retrieved January 2, 2014. ^ Hughes, Hilary (July 29, 2013). "Deer Tick John McCauley Interview". esquire.com. Retrieved December 29, 2013. ^ "First four November tour dates cancelled!". facebook.com. November 5, 2013. Retrieved December 29, 2013. ^ Paylor, Juliet (November 6, 2013). "Baby heartbreak for Vanessa Carlton as she undergoes emergency surgery following ectopic pregnancy". Daily Mail. London. Retrieved December 29, 2013. ^ Ehrich Dowd, Kathy (December 28, 2013). "Vanessa Carlton Marries John McCauley – and Stevie Nicks Officiates". people.com. ^ Bradley, Tyler (June 26, 2014). "Vanessa Carlton Announces Pregnancy, New Album In 2015". Billboard.com. Retrieved June 26, 2014. ^ Vulpo, Mike (January 13, 2015). "Vanessa Carlton Gives Birth! Singer's Husband Shares Baby Photo Straight From the Delivery Room!". E!. United States: eonline.com. NBCUniversal. Retrieved January 13, 2015. 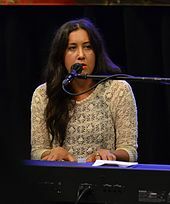 Wikimedia Commons has media related to Vanessa Carlton.